Jumbo Sav A Wrap 15 X 10 3/4 (500 Sheet) Box Price. Junior Sav A Wrap Tissue 8" X 10 3/4" 1000 Sheet Box Price. Junior Sav A Wrap Tissue 8" X 10 3/4" Case Price 500 Sheets. Midget Sav A Wrap Tissue 6" X 10" 1000 sheet box. Senior Sav A Wrap 10" X 10 3/4" 1000 sheet box. 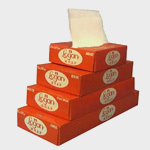 Senior Sav A Wrap Tissue 10 X 10 3/4" Case Price 500 per box.